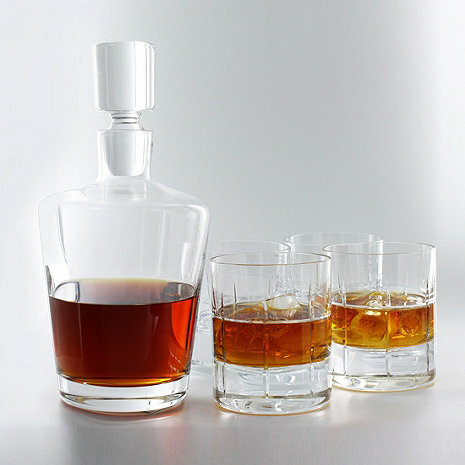 Share in the rich tradition of Whiskey drinking with this classic Whiskey decanter set. Featuring a mouth-blown European decanter and substantial bar glasses that exude character, this set has an old-fashioned feel with a modern touch. Share in the rich tradition of Whiskey drinking with this classic Whiskey decanter set. Featuring a mouth-blown European decanter and substantial bar glasses that exude character, this set has an old-fashioned feel with a modern touch. Can we get this engraved with initials? Are the glasses heavy? I will be buying this set for my husband. His only request was for heavy glasses. BEST ANSWER: Thank you for your question, these are a nice size glass and have nice substance & weight to them also. These are mouth blown substantial bar glass sets. Is this lead free glass? Thank you. BEST ANSWER: The 5 Piece Whiskey Decanter Set is made of lead free glass. Does this Decanter set contain lead? I bought this for my husband and he just loved it! It is a great set for a great price. He wanted some heavy glasses and these are it. Although the top of the glasses are thin and seem fragile, we'll see how long they last. Overall, It was what my uusband and I were looking for. Heavy, high quality glasses and decanter! Loved them!! !